Throughout my husband’s deployment, our family has relied on the amazing support we receive from Operation: Military Kids (OMK), a support program funded by the Department of Defense and administered by the USDA. The program hosts free events all over the state for military kids to connect with others who understand exactly what they are going through. 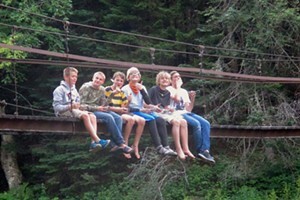 I’ve witnessed firsthand what a great service it provides — I so appreciate what it does for our boys. 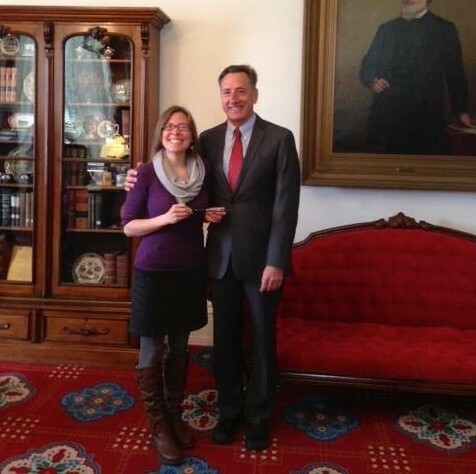 To learn more about the program, I recently interviewed Stephanie Atwood, the coordinator of Vermont’s OMK (pictured, with Gov. Shumlin). She explains what OMK does — and why she’s so passionate about her work. Why did you decide to work with military families? My mom grew up as a “military child,” moving from state to state, often country to country. She never stayed in the same school for very long, which meant she constantly had to “start over” with friendships. I don't think I had ever really considered the impact those transitions had on her until I learned about OMK. I can now see how disruptive that movement can be for a child, and my mom has confirmed that it wasn’t easy. She was the oldest of eight, which meant she had a pretty big role to play in the family, especially when her dad was away. I think the combination of constantly moving from place to place and needing to help out so much around the house caused my mom to grow up pretty quickly. I’m not sure she had as much of a “childhood” as she would have liked. I realized that I was the type of person [OMK] aimed to reach — the type of person who recognizes the importance of supporting military kids once they understand more about deployment and military life; the type of person who wants to take action because of that new knowledge. That's when I decided to officially sign on as [an AmeriCorps] VISTA with OMK — and I've stayed ever since! What’s the history of OMK in Vermont? As the global war on terror ramped up close to 10 years ago, the United States Department of Agriculture and Department of Defense began to look for collaborations to support military families affected by deployment. Operation: Military Kids began in 2004 in a handful of states with high populations of deployed military personnel. Vermont was not eligible to apply until 2008, when we received our first round of funds. OMK programs in Vermont are open to military-connected children and youth ages 6 and up. That means children and youth who have a parent or loved one — aunt, uncle, brother, sister, grandparent, etc. — connected to the military, whether they’re currently deployed or not. The mission in 2008 still stands today: to educate community members on the cycle of deployment and related topics, so that communities can better support their military families. [It also aims to] provide positive youth-development opportunities for our military children, so that they gain the skills and relationships necessary to handle deployments and other challenges that come their way. [The emphasis is on] individual and family resiliency, as well as mobilizing communities to support their local military families. In a state like Vermont, where a high percentage of our military is National Guard, our families are spread out around the state, often disconnected from other military families and the resources you’d normally find on a military base. I think it makes a lot of sense to connect military families to the resources that already exist in their own communities, such as youth-serving organizations or school guidance counselors. It’s part of OMK’s job to help make those connections. [We work] to educate Vermonters about deployment, reintegration — the period of time after a deployment — and, really, the overall impact “military life” can have on a child. With this greater understanding, we believe community members will be better prepared and more likely to show their support for our military children and youth. [It] would have to be working with the kids. A lot of my time is spent working in my office, so when I'm finally able to get out there and run a program or visit with families, it's extra special. Over the years, I've been able to get to know the kids we serve (and their parents, too), and it makes me so happy to see them return to our programs again and again. What message do you hope to spread through OMK? Support is still needed for our military families. Just because the "big" Army National Guard deployment of a few years ago is over doesn't mean families no longer need our support. Deployments continue — obviously! — and we also know that something as seemingly small as a drill weekend can have a huge impact on a child.